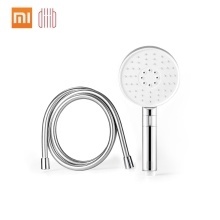 – 120mm large water output surface, up to 53 water output holes designed on the shower head. – Three splash modes: Soothing water stream, Powerful massage stream, Vibrant mixed water stream. – One-hand to switch the water splash you need, starting your shower travel just needs a gentle toggle with your finger. – Anti-twisting Tube can lengthen to 1.6m，360 degree rotating, let you freely have a shower. – 5-layer PVC coating, high-quality, easy to clean and use. – Anti-twisting tube with temperature cold or hot in the insulated function and 360 degree rotating, makes a easeful showering. Splash modes: Soothing stream, Powerful massage stream, Vibrant mixed stream. 1.The Installation Service is not included. 3.Product size, product weight, and related specifications are theoretical values only. Actual measurements between individual products may vary.